The 2010 PGA Championship will never be remembered as the on Martin Kaymer won. It will go down as the Championship that was stolen from Dustin Johnson. Yes there is sand there, but can you treat a bunker that is trampled for a week the same as one inside the ropes? The young American stood on the 18th tee with a one stroke lead in the final group. His tee shot was sprayed right into the gallery. Upon reaching it he had a fair distance into the 500-yard par four. 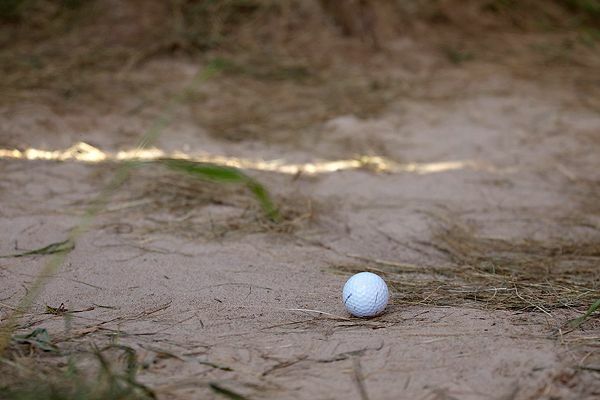 As they showed his ball I thought, “wow he got lucky to get such a good lie in that bunker.” After all, there are well over 1,000 bunkers at Whistling Straits. Upon addressing the ball, Johnson grounded his club and I knew then he was in trouble. But, he didn’t realize his folly, nor did any of the hundreds of spectators or the TV crew, or anyone else for that matter. I had the sinking feeling that he had broken the rules, but it didn’t seem to strike him as he hit his approach. He made bogey and was set for his playoff when the rules officials grabbed him. They explained his folly, assessed the two-stroke penalty and the long-driving American was knocked out of the playoff. All areas of the course that were designed and built as sand bunkers will be played as bunkers (hazards), whether or not they have been raked. This will mean that many bunkers positioned outside of the ropes, as well some areas of bunkers inside the ropes, close to the rope line, will likely include numerous footprints, heel prints and tire tracks during the play of the Championship. Such irregularities of surface are a part of the game and no free relief will be available from these conditions. So, they covered their tracks in terms of having a debacle similar to what happened to Stuart Appleby in 2004. Unfortunately, they didn’t prevent the same thing from happening. I admit that I knew from the first moment that Johnson was in a bunker. That is because my first view of his ball was when the crowd had dispersed. Approaching that lie at ground level would have been a totally different experience. Not a single person on the TV broadcast knew it either. The bunker was in a high-traffic area for spectators along the 18th fairway. It had been stood in and walked through since Monday, it clearly did not resemble a traditional bunker. In fact, when I saw Johnson ground his club and not correct his mistake, I figured there must have been some accommodation made for the bunkers that were trampled by the fans all week long. Unfortunately no such provision had been made and Johnson paid the price for it. He shouldn’t have fallen victim to this rule though. Yes, the onus is on the player and his caddy to be aware of the surroundings. But when the original layout of the course has been altered so drastically by the fans and workers throughout the week, the same rules should not apply. That bunker looked like a flat area that had been trampled by fans since the practice rounds, Johnson said as much too in his post-round interview. Clearly that is not a player who was aware he was standing in a bunker on the 18th hole on the verge of winning his first major. The PGA really screwed up in not making a provision for Johnson in that case. The rules officials were watching the same monitor Johnson was in that scoring room. They knew the state of that “bunker” this is on them as much as it is the young man robbed of the victory. I’m sure all those rules officials are scratch golfers who have never made a mistake on the golf course, ever. It is more likely they are the idiots you see shooting 115 on Saturday afternoon that line up every putt like they are about to win the Masters. I say kudos to Johnson for calling himself on the rule. Never once did he fight the accusation that he grounded his club. He stood up to that fact. But, he should not have been penalized. Had he grounded his club in the bunker in front of the 8th green it would be a different story. But when you can’t tell the difference between the trap and your parking spot at the local drive in, I think there should have been a closer look at such a precise ruling. Now, there is no guarantee that Johnson would have won in the playoff. He could have as easily dumped his approach on 18 in the drink like Bubba Watson did. Ultimately, I think Martin Kaymer was set up to win the playoff. Watson – even Johnson – are go-for-broke kind of players who excel in a situation where they can play an aggressive game with the ability to make up for a bad score. A three-hole playoff doesn’t allow for that, Watson showed us why. So, maybe the ruling wouldn’t have mattered, but we didn’t get the chance to see. I suppose it is a good thing Johnson didn’t make his par putt on 18. It would have been an even bigger heartbreak to see the Championship stolen from him on such a questionable ruling. And Gene Wojciechowski’s analysis of Johnson’s gaffe – a poor analysis in my opinion. I understand that Johnson made a crucial error and that the rules sheet stated the exact ruling for the week. But, you cannot expect a cosmetic bunker, that has been beaten on by thousands of people, to be treated the same as a bunker that sits alongside a green. Next time there shouldn’t be a single fan allowed in a single bunker on the course, maybe we would avoid such a terrible result. Previous Article Did you expect any less from the Bills?